Agnès Varda won “The Golden Eye”prize for best documentary, at Cannes on May 27 for her latest film, Visages Villages (Faces Places), produced by Varda’s production company, Ciné Tamaris, and Rosalie Varda. 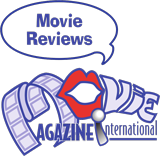 The style of the film is candid and forthcoming emphasizing the things we take for granted, the people we don’t know about, and the heroic people behind the scenes who are worthy of our attention. 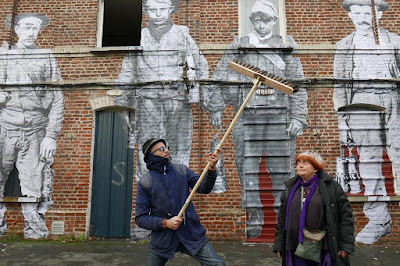 Together with the French street artist JR Varda travels throughout parts of France in a van with a huge camera painted on the side. JR makes huge posters on the sides of buildings or large objects, even though they may later disappear through rain, or the waves of the ocean. In their van, Varda and JR meet women who work in a cargo ship container company and their images are pasted onto the containers. Seen from afar they show the women behind the men who stack these large objects The artists visit the brick homes of a mining ghost town that would have been forgotten if not for a woman who refused to move. Her image is pasted onto her home. A huge piece of metal from a ship on a beach gets a facelift, but by the next morning, it is gone. JR seems to remind Varda of the frivolity of JL Godard – for on their travel itinerary they play to pay him a visit. With his favorite pastries from a local bakery in hand, as expected, Jean Luc refuses to answer the door. It is clear that Varda is disappointed but his absence is not missed as the veteran filmmaker does not work as either of the artists and would have been a departure for their journey.